Stories Told takes you back into the epic journey of the Berger Inquiry, as Judge Berger travelled from community to community to hear stories told from the hearts of the people who lived in the lands of the North from time immemorial. Through the telling of vivid stories about life on the land, the course of history in Canada was altered as the pipeline was halted and democracy was reborn. 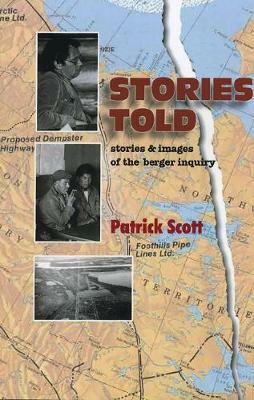 Patrick Scott moved to the North in 1975, just prior to the beginning of the Berger Inquiry on an 11-month contract with the Canadian Broadcasting Company (CBC). He never left. He married Gabrielle Scott Mackenzie in 1977 and together, they have raised eight children. His career in the North has been eclectic, varying from his initial work as a cameraman to being a contract plumber, a journalist, a negotiator, to managing a national community development program in First Nation communities across Canada.